Lithium fluoride is an inorganic compound with the chemical formula LiF. It is a colorless solid, that transitions to white with decreasing crystal size. Although odorless, lithium fluoride has a bitter-saline taste. Its structure is analogous to that of sodium chloride, but it is much less soluble in water. It is mainly used as a component of molten salts. Formation of LiF from the elements releases one of the highest energy per mass of reactants, second only to that of BeO. LiF is prepared from lithium hydroxide or lithium carbonate with hydrogen fluoride. Fluorine is produced by the electrolysis of molten potassium bifluoride. This electrolysis proceeds more efficiently when the electrolyte contains a few percent of LiF, possibly because it facilitates formation of an Li-C-F interface on the carbon electrodes. A useful molten salt, FLiNaK, consists of a mixture of LiF, together with sodium fluoride and potassium fluoride. The primary coolant for the Molten-Salt Reactor Experiment was FLiBe; LiF-BeF2 (66-33 mol%). Because of the large band gap for LiF, its crystals are transparent to short wavelength ultraviolet radiation, more so than any other material. LiF is therefore used in specialized UV optics, (See also magnesium fluoride). 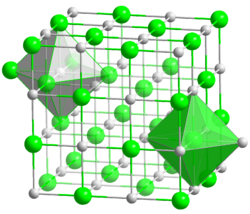 Lithium fluoride is used also as a diffracting crystal in X-ray spectrometry. (n,alpha) nuclear reaction) in thermoluminescent dosimeters. 6LiF nanopowder enriched to 96% has been used as the neutron reactive backfill material for microstructured semiconductor neutron detectors (MSND). Lithium fluoride (highly enriched in the common isotope lithium-7) forms the basic constituent of the preferred fluoride salt mixture used in liquid-fluoride nuclear reactors. Typically lithium fluoride is mixed with beryllium fluoride to form a base solvent (FLiBe), into which fluorides of uranium and thorium are introduced. Lithium fluoride is exceptionally chemically stable and LiF/BeF2 mixtures (FLiBe) have low melting points (360 °C - 459 °C) and the best neutronic properties of fluoride salt combinations appropriate for reactor use. MSRE used two different mixtures in the two cooling circuits. Lithium fluoride is widely used in PLED and OLED as a coupling layer to enhance electron injection. The thickness of the LiF layer is usually around 1 nm. The dielectric constant (or relative permittivity) of LiF is 9.0. Naturally occurring lithium fluoride is known as the extremely rare mineral griceite. ^ a b J. Aigueperse, P. Mollard, D. Devilliers, M. Chemla, R. Faron, R. Romano, J. P. Cuer, "Fluorine Compounds, Inorganic" in Ullmann’s Encyclopedia of Industrial Chemistry, Wiley-VCH, Weinheim, 2005. doi:10.1002/14356007.a11_307. ^ S.L. Bellinger et al. "Improved High Efficiency Stacked Microstructured Neutron Detectors Backfilled with Nanoparticle 6LiF," IEEE Trans. Nucl. Sci., 59 (2012) 167-173 . ^ "Crystran Ltd., a manufacturer of infrared and ultraviolet optics". Retrieved 2010-12-28. ^ D.S. McGregor, S.L. Bellinger, and J.K. Shultis, "Present Status of Microstructured Semiconductor Neutron Detectors, 379 (2013) 99-110. ^ C. Andeen, J. Fontanella,D. Schuel, "Low-Frequency Dielectric Constant of LiF, NaF, NaC1, NaBr, KC1, and KBr by the Method of Substitution", Physical Review B, 2, 5068-5073 (1970) doi:10.1103/PhysRevB.2.5068.